US Birthright Issue. Donald Trump wants to end US birthright citizenship issue for children of non-citizen, unauthorized immigrants. US president Donald Trump had commitlted before election and also fater it that he is planning to sign an executive order ending birthright issue of the United States illegal migrants child.The automatic bestowed citizenship to any individual born in the US territory. Birthright citizenship also applies to children born elsewhere in the province to US citizens (with certain exceptions ) known as Jus Sanguinis. If Indian husband-wife goes to United States on Visa and if wife is pregnant and she gives birth to baby on US teritory then according to the US law that baby is applicable for United States citizenship thats law says. If husband and wife citizens of united states and goes to travel to anothercountry and wife is pregnant. If she gives baby on that countries soil then also that baby is automatically will be citizen of united states because of parents are citizens of USA, It is ancestors birthright issue to baby. Jus Soli is Latin term that means law of the soil or mother land. A lot of countries follow the route of jus Soli or more commonly known as, birthright citizenship. Under this concept, citizenship of a person is determined or recognised by the place where a person was born. It is the most common thing means a person acquires citizenship of a Nation. Another system called Jus Sanguinis is when a person gets citizenship through their parents or ancestors. Some countries that follow the Jus Soli system includes-: Argentina, Barbados, Peru, United States, Brazil, Canada, Mexico, Pakistan, Uruguay. Many Nations have tradition of Jus Sanguinis and Jus Soli including the United States, Canada, Israel, Greece, Germany etc. The idea of the Jus Soli (right of the soil) derives from the 14 amendments to the US Constitution enacted in 1868 after the civil war in order to grant legal rights to former slaves. It says all the person who born or naturalised in the US, and subject to the jurisdiction thereof, are citizens of the United States and of the state where in they reside. Why Trump wants US should keep at bay from the Jus Soli ? Trump believes that many illeagl immigrants are exploiting unitUn States birthright law. Trump wants to stop Birth Tourism. Trump consider that comes to US to give birth his/her baby as travel. Tour is travel to another country for the purpose of giving birth in the country. ‘Anchor Baby’ is another relevant term which can have negative connotations in US. 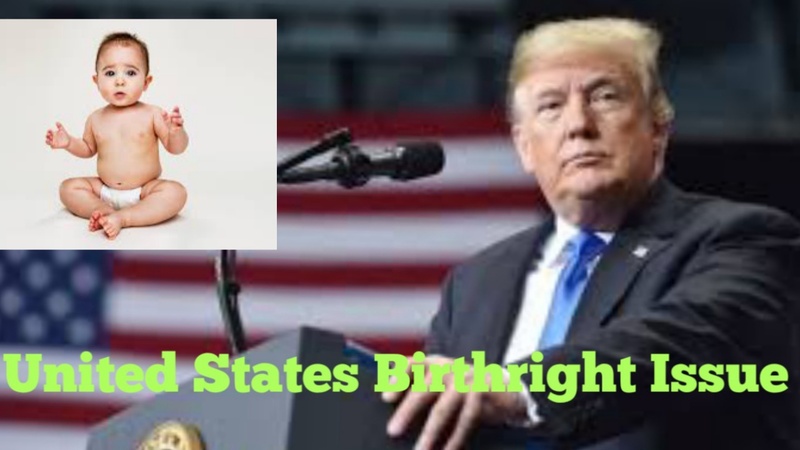 The main reason for such birth tour is to obtain citizenship to their child in a country with birthright citizenship (Jus Soli) as it is weak law consider Trump. We hope you understood about United States Birthright issue For more update follow us! Can there be a Sixth Takht in Sikh religion latest burning issue ?